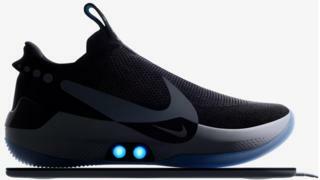 Nike’s new self-lacing trainer, the Adapt BB, has fallen at the first hurdle after the Android app that controls the shoe malfunctioned. Billed as the “future of footwear”, the $350 (£268) a pair Adapt BB launched on Sunday. However, an update to the Google Android app that allows wearers to loosen or tighten the trainer failed to work. Customers complain that the Android app only syncs with one shoe. The shoe can be controlled manually using two buttons on the side. But people are frustrated that the Android app fails to work. The Adapt BB contains a small motor which pulls the laces inside the trainer. Nike claims it has reinvented the shoe lace – which “dates back to 3500 BC, before Stonehenge or the Pyramids” – with its Adapt BB. Nike has been contacted for comment. It has been a difficult week for the company. On Wednesday, Zion Williamson, a college basketball star for Duke University in South Carolina, slipped and fell when one of his Nike trainers split apart. The incident sent Nike’s share price down more than 1% in yesterday’s trading.